Detroit, MI - Detroit Red Wings® Executive Vice President and General Manager Ken Holland and Toronto Maple Leafs® Vice President of Hockey Operations Dave Poulin today announced preliminary rosters for the 2012 Maple Leafs vs. Red Wings Alumni Showdown™ on December 31 at Comerica Park™, part of the 2012 SiriusXM Hockeytown Winter Festival™. 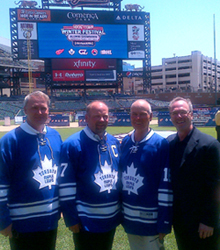 Holland also announced that due to overwhelming response from the Detroit and Toronto Alumni Associations, as well as the challenges each franchise faced in narrowing down a multitude of hockey legends on to one roster, fans will now be treated to two alumni games featuring close to 100 players from these two storied franchises for just one ticket price. "When we began the process of determining who should be on the roster for the Red Wings® alumni team, it became very obvious, very quickly that we simply did not have enough room on one bench to hold enough of the many deserving players," said Holland. "When we contacted Toronto and asked them what they thought about the possibility of two games, they immediately breathed a sigh of relief as they were going through the exact same issues we were in trying to fit all these players on one team." Detroit Red Wings® alumni members confirmed to appear in December's 2012 Maple Leafs vs. Red Wings Alumni Showdown™ include: 50-goal scorers Mickey Redmond and John Ogrodnick; Hall of Famers Luc Robitaille, Dino Ciccarelli, Chris Chelios, Larry Murphy and Mark Howe; all four members of 'The Grind Line' – Kris Draper, Kirk Maltby, Darren McCarty and Joe Kocur; Stanley Cup-winning goaltenders Chris Osgood and Mike Vernon; and Red Wings® legends Gordie Howe, Ted Lindsay and Alex Delvecchio. 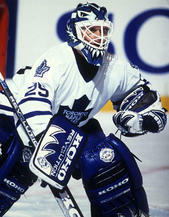 Members of the Toronto Maple Leafs® alumni scheduled to participate on New Year's Eve at Comerica Park™ include: Hockey Hall of Famer Darryl Sittler; 50-goal scorer Rick Vaive; fan favorites Darcy Tucker, Felix Potvin, Mike Palmateer and Kevin Maguire; Stanley Cup champions Dave Andreychuk and Doug Gilmour; rough and tumble winger Wendel Clark; 454- win goaltender Curtis Joseph; and Maple Leafs® legends Johnny Bower, Ron Ellis and Jim McKenny. Toronto Marlies and the 48th Annual Great Lakes Invitational will go on sale to the public on August 1. The 2012 Maple Leafs vs. Red Wings Alumni Showdown™, now a special two-game event for just one ticket, will go on sale to Red Wings® and Maple Leafs® season ticket holders on August 1, followed by a public on sale in mid-August." In addition to the incredible slate of games scheduled to take place in late December at Comerica Park™, the 2012 SiriusXM Hockeytown Winter Festival™ lineup will also include an outdoor Red Wings practice that will be open to the public, local high school hockey games, youth hockey games and open skates, including a "Skate with Santa" throughout the two-week period leading up to the New Year. Fans can find complete information on all 2012 SiriusXM Hockeytown Winter Festival™ events at www.DetroitRedWings.com/2013WinterClassic. Additional player announcements for the 2012 Maple Leafs vs. Red Wings Alumni Showdown™ will be made in the coming weeks as both teams continue to confirm the participation of some of the all-time greats to ever don the sweaters of these two Original Six franchises. "We are incredibly proud to be part of this great sports town and our organization is committed to making the 2013 Bridgestone NHL Winter Classic® the best ever," added Wilson. "The announcements made today revealed some of the details about the 2012 SiriusXM Hockeytown Winter Festival™ and the exciting games to be played at Comerica Park™. We are confident that everyone will be able to join in this wonderful celebration of the great sport of hockey and the city of Detroit." December 15-26 Celebration of Hockey amateur games, corporate outings and open skates. Information on booking ice time can be obtained by visiting DetroitRedWings.com/icetime. December 27-31 Outdoor Festival featuring interactive games, autograph signings, face painting and ice sculpture exhibits as well as musical performances and live entertainment. December 27-28 Great Lakes Invitational featuring the Michigan Wolverines, Michigan State Spartans, Western Michigan Broncos and Michigan Tech Huskies all competing for the 2012 MacInnes Cup. December 29 Ontario Hockey League Double-header featuring the Windsor Spitfires taking on the Saginaw Spirit and the Plymouth Whalers battling the J. Ross Robertson Cup champion London Knights. December 30 American Hockey League Game featuring the Grand Rapids Griffins and Toronto Marlies, AHL affiliates of the Red Wings® and Maple Leafs®. December 31 2012 Maple Leafs vs. Red Wings Alumni Showdown™ Double-header featuring two games of legendary players from two of the National Hockey League's most storied franchises going head-to-head. 2012 SiriusXM Hockeytown Winter Festival™ GLI, AHL and OHL tickets will go on sale Wednesday, August 1 at DetroitRedWings.com, ticketmaster.com or by calling 313-396-7575. A limited number of 2012 Maple Leafs vs. Red Wings Alumni Showdown™ tickets will be made available in mid-August via ticket lottery. Fans should register at DetroitRedWings.com/ 2013winterclassic to receive all the latest information on these events. 2013 Bridgestone NHL Winter Classic® tickets are currently available for Red Wings® and Maple Leafs® season ticket holders as part of a pre-sale process. Additional ticket information will be released at a later date. Fans should register at DetroitRedWings.com/2013winterclassic to receive all the latest ticket information.